Ever since the birth of rock ’n’ roll, there’s been many short-lived record labels, including small, obscure local labels founded to release privately pressed albums, to regional labels that released just a handful of singles before closing their doors for the last time. Other labels lasted slightly longer, but were hardly prolific, including Robin Page’s controversial Cologne-based label Pyramid Records which recorded just eleven albums between 1972 and 1976. This included Temple’s eponymous debut album Temple which has just been reissued by Mental Experience, an imprint of Guerssen Records. 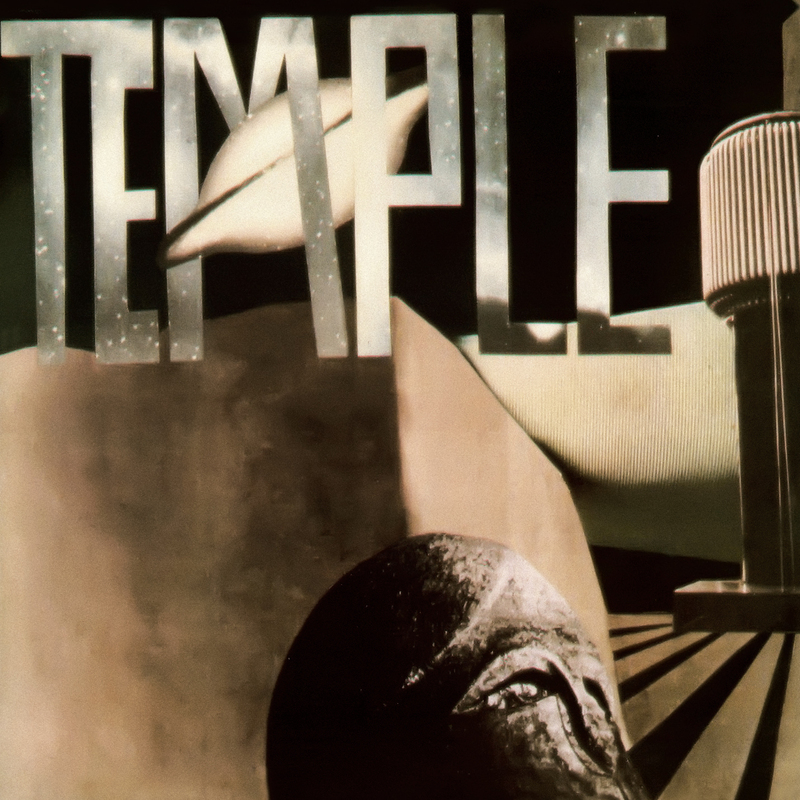 However, just like any Pyramid Records’ reissue, the rerelease of Temple is sure to provoke debate and speculation, with the doubters wondering whether the album really recorded in the seventies, or at a later date? The Pyramid Records’ story began in Cologne in 1972, when the label was founded by forty-year old British expat Robin Page, who was one of the leading lights in the burgeoning Fluxus arts movement. He had moved from London, England to Cologne, in West Germany in 1969, which had been his home ever since. However, it turned out that Robin Page wasn’t the only expat who was living in Cologne during that period. Cologne was also home to Tony Robinson, a South African, who had travelled from his home in Cape Town, to West Germany to work with the legendary Karlheinz Stockhausen, the Godfather of modern German electronic music at the WDR Studio. This was where akin to a musical apprenticeship for Tony Robinson, and served him well in the future. After he left Karlheinz Stockhausen’s employ, Tony Robinson started working at Dierks Studio, near Cologne, and it was around this time that he met Robin Page. By then, Robin Page was a successful and established artist whose work within the Fluxus movement was regarded as ambitious, daring and groundbreaking. One of the trademarks of Robin Page’s work was humour, which he used to challenge what was regarded as good taste within the art establishment. Before long, Robin Page’s paintings started to find an audience, and became particularly sought after, which was what Robin Page had dreamt of, and worked towards ever since ‘he had left’ art college in Vancouver. His new-found success and financial security allowed Robin Page to work towards fulfilling another of his dreams, making music. Robin Page was so serious about making music, that he decided to invest some of his newfound fortune in building a recording studio. This wasn’t a luxurious state-of-the-art recording studio that was situated within a fashionable area of Cologne. Instead, the studio was situated in the basement of what looked like a derelict building. It was an unlikely place for Cologne’s newest recording studio, and where the nascent Pyramid Records first album was recorded. It was then pressed by a Turkish entrepreneur, who just happened to keep his cutting lathe within the same building as the studio was situated. The lathe which it’s been alleged was used to produced bootleg albums, was used to cut what became PYR 001, Pyramid Records’ first ever release. Robin Page then commissioned a local student to design the album cover to PYR 001, which was released later in 1972. Robin Page had just made with the release of Pyramid Records’ first album. Just like many private presses released in 1972, Robin Page had only a small number of copies of PYR 001 pressed. He decided to press between 50 and 100 albums, which became the norm for future Pyramid Records’ releases. It’s claimed that some of the albums were sold in Cologne’s art galleries and clubs, while Robin Page gave some of his closest friends copies of PYR 001. This included one of his one newest friends, Toby Robinson. Robin Page had first encountered Tony Robinson in Cologne, in 1972. It turned out that the engineer shared the same circle of friends as Robin Page, which included a number of local artists and musicians. Some of these musicians would join Tony Robinson at Dierks Studio for after hours’ jam sessions, which would allow the engineer to experiment with effects as he sculpted sonic soundscapes. It’s claimed that some of these musicians would later feature on Pyramid Records’ recordings. That was all in the future. Not long after Robin Page met Toby Robinson, the artists managed to persuade his new friend to provide the material for Pyramid Records’ second release. Toby Robinson’s recordings featured sounds that were bounced from one reel-to-reel tape recorder to another. After he had an album’s worth of material, a master was cut, and between 50-100 copies of PYR 002 were either given away to Robin Page’s friends, or sold in Cologne’s art galleries and clubs. However, there was a problem with the label’s first two releases. Over the next few years, the master tapes and the last remaining copies of PYR 001 and PYR 002 were mislaid, and it was as if the two albums had never existed. This was something that those who were keen to disprove the existence of Pyramid Records seized upon at a later date. So would what happened next. During 1973, Robin Page’s Pyramid Records released two further albums, PYR 003 and PYR 004, with between 50 and 100 copies of each album being pressed. Again, some albums were sold in Cologne’s art galleries and clubs, while Robin Page gave copies to some of his closest friends. However, over the next couple of years, incredibly the master tapes and remaining copies of PYR 003 and PYR 004, were mislaid. History had repeated itself, again, it was as if PYR 003 and PYR 004 had never existed. The master tapes seemed to have vanished into thin air, and forty-five years later, it’s as if Pyramid Records first four releases never existed. This would later provide more ammunition to those trying to disprove the very existence of Pyramid Records. The first Pyramid Records release to survive is believed to be PYR 005, which is the Cozmic Corridors’ eponymous debut album. It’s one of just eleven recordings that remain in the Pyramid Records’ vaults. These recordings were made between 1974 and 1976 and include Temple’s eponymous debut album Temple. Just like Pyramid’s eponymous debut album, there’s a degree of confusion surrounding the recording of Temple. The exact date of the recording sessions are unknown, and the best guess is that Temple was recorded during 1975 or 1976 at Dierks Studio. It’s thought that Temple was the result of a number of late night, after hours recording sessions where musicians joined Tony Robinson in the studio. Some of these musicians are thought to have been recording at Dierks Studio before joining the Temple Sessions. A couple of the musicians, including lyricist and vocalist Pauline Fund is thought to have featured on Cozmic Corridors, another Pyramid Records’ release. Other musicians that featured on Temple are though to be well known names, and include Zeus B. Held who was a member of Birth Control between 1973 and 1978. However, speculation sounds the identity of those who played on Temple as pseudonyms were used and there’s discrepancies between the original album cover and the 1997 reissue. The lineup of Temple feature a rhythm section of drummer Otto Bretnacher, bassist Joachim Weiss and guitarists Heinz Kramer and Rolf Foeller. They were joined by Zeus B. Held on Hammond organ, Mini Moog and Mellotron, while vocalist included Poseidon and Pauline Fund plays Tambourine. Interestingly, Tony Robinson’s name is written large all over Temple, and he wrote parts of Temple with Rolf Foeller and Pauline Fund. However, Tony Robinson is also credited as “performer/multi-instrumentalist” under his Mad Twiddler moniker and the recordist F.B. Nosnibor looks like another of his many pseudonyms. He’s part of the group that is thought to have recorded Temple during 1975 and 1976. Temple must have been one of the last albums that Pyramid Records released, as Robin Page’s label closed its door for the final time in 1976, when he decided to emigrate to Canada. He took with him the master tapes to the Pyramid Records’ releases and the albums that he hadn’t sold or given away to friends. This is why after Robin Page emigrated to Canada, it looked like Pyramid Records had never existed. Twenty years later, and Tony Robinson approached Virgin Records with some of Pyramid Records’ master tapes. This resulted in the release of Unknown Deutschland-The Krautrock Archive Volume 1 in 1996. Later that year, two further volumes followed, and Temple’s eponymous debut album was reissued for the first time in 1997. Given its rarity, collectors of Krautrock were keen to add a copy Temple album to their collection, and the album soon sold out. Listeners were in for a surprise. Having listened to Temple, many listeners realised that it sounded as if two different bands had played on the album. This added to the rumour and speculation that was already rife about the mysterious Pyramid Records, and has continued to build up ever since. Twenty-one years later, and Mental Experience’s reissue of Temple will result is bound to result in further speculation about Temple. While it sounds as if two bands played on Temple, that comes as no surprise as the lineup of Temple was fluid, with different musicians playing on the sessions. This included multi-instrumentalist Tony Robinson. However, one thing that caused much of the speculation was the use of two different vocalists on Temple. Three of the tracks sounded as if they had been recorded by a hard rocking, heavy psychedelic rock band that was led by a vocalist that sounded as if he had been inspired by The Damned’s Dave Vanian. This includes the album opener Heathen, Ship On Fire and Crazy Hat/Kingdom Of Gabriel which closes Temple. However, the identity of the vocalist that features on these three tracks, and dawned the moniker of Poseidon as he sung the lyrics in English is unknown? Could this have been Tony Robinson who played such an important part in the record of album? His influence can be heard on these three tracks as he unleashes a myriad of effects throughput this genre-melting album where Temple unleashed a fusion of hard rocking, heavy psychedelic rock with Krautrock, and space rock. Then it’s all change. The remainder of the songs on Temple, including Leaves Are Falling/Black Light, Age Of Ages, sounded as if they had been recorded by an otherworldly gothic folk band fronted by French female vocalist Pauline Fund. Her vocal veers between dramatic, dubby, eerie, ethereal and mysterious as the music becomes dreamy, lysergic and theatrical. Especially as Pauline Fund delivers a soliloquy on Age Of Age. These two tracks show a very different side to Tempe and features elements of art rock, avant-garde, dub, folk-rock and a proto-gothic sound. That is as long as Temple was recorded before the gothic style of music became popular. Ever since Tony Robinson approached Virgin Records with some of Pyramid Records’ master tapes, which resulted in the release of Unknown Deutschland-The Krautrock Archive Volume 1 in 1996, rumour and speculation has surrounded Robin Page’s short-lived label. The doubters have tried to disprove the very existence of Pyramid Records, and some believe that it’s nothing more than a musical hoax, akin a to modern-day great rock ’n’ roll swindle. To prove their case, the doubters have left no stone unturned. One of the main thrusts of the doubters arguments is if Robin Page took the master tapes and remaining copies of the Pyramid Records’ albums to Canada, where did the master tapes Tony Robinson took to Virgin Records’ come from? It may be that these tapes were duplicates that were only discovered at a later date? Some of the doubters believe that at least some of the albums, especially the unreleased ones may have been recorded at a later date, either in the eighties or nineties. Despite examining everything from the recording techniques and instruments used, they’ve been unable to prove beyond all reasonable doubt these albums were recorded post 1976. This hasn’t stopped the doubters saying that some of the albums sound as if they were recorded at a later date. Sadly, all the debate and speculation surrounding Pyramid Records gets in the way of what are important and exciting reissues of albums by groundbreaking groups like Temple. This short-lived studio band that features mostly anonymous musicians sounds as if it was inspired by Amon Düül II, Ash Ra Tempel, Birth Control, Hawkwind and Popol Vuh as they recorded what was their one and only album Temple. Just like so many of Pyramid Records’ releases, Temple features music that is ambitious, innovative and way ahead of its time, and would never have been recorded and released if it wasn’t for Robin Page and his short-lived label which championed esoteric music including Temple’s. ← MELVIN SPARKS-TEXAS TWISTER-RECORD STORE DAY EDITION.